Simple and effective white label app for displaying the calendar schedule. 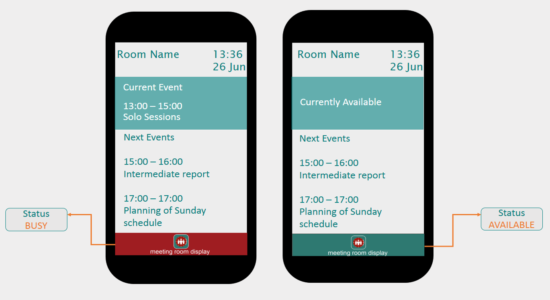 Meeting Room Schedule app is for small businesses and cost aware organizations that do not want to pay hundreds of dollars for a single calendar display. 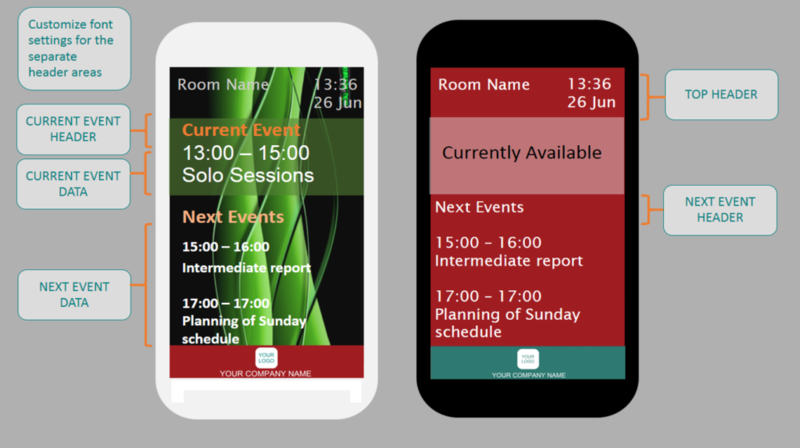 Any team sharing resources like meeting rooms, vehicles and equipment can benefit from a dedicated on site display. 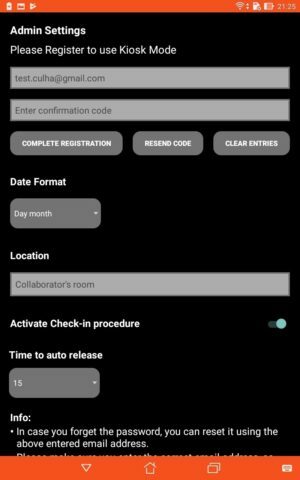 Get a tablet device, install the app, configure your calendar data connection and tune your font settings. Mount the tablet on the wall or put it where people will look and you are done. Want to know if the resource is occupied or not? 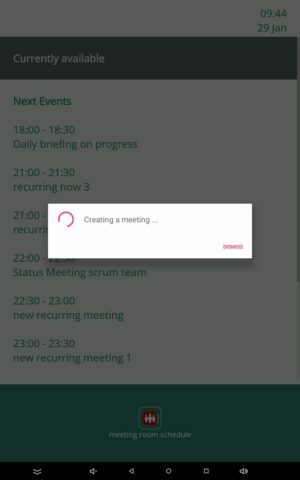 Meeting Room Schedule app makes available the real-time status of the resource. 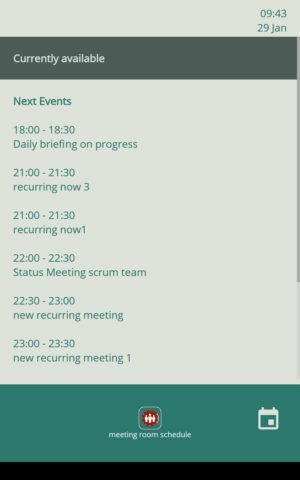 It also shows which event is currently going on and what are the upcoming or scheduled events for later. 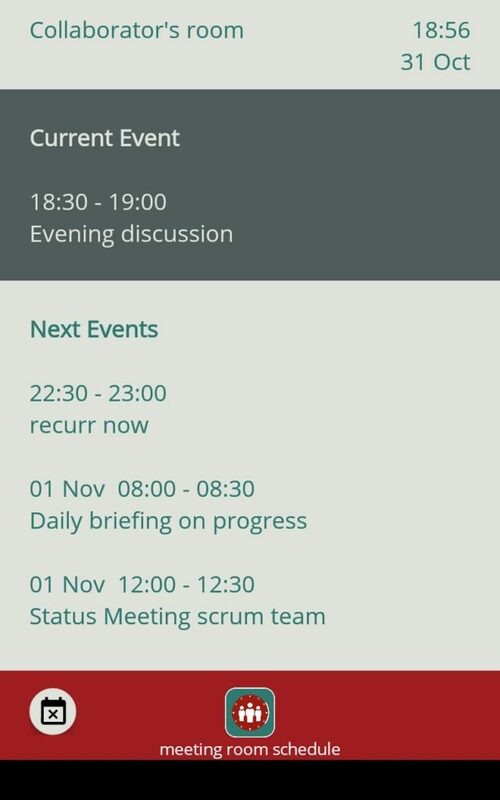 The eye-catching red & green color ribbons spells out the status of the meeting in a single glance. No more walking around to spot the resource. The resource name and the calendar are displayed on the mounted tablet. Check out the video demo of real-time integration with your calendar here. 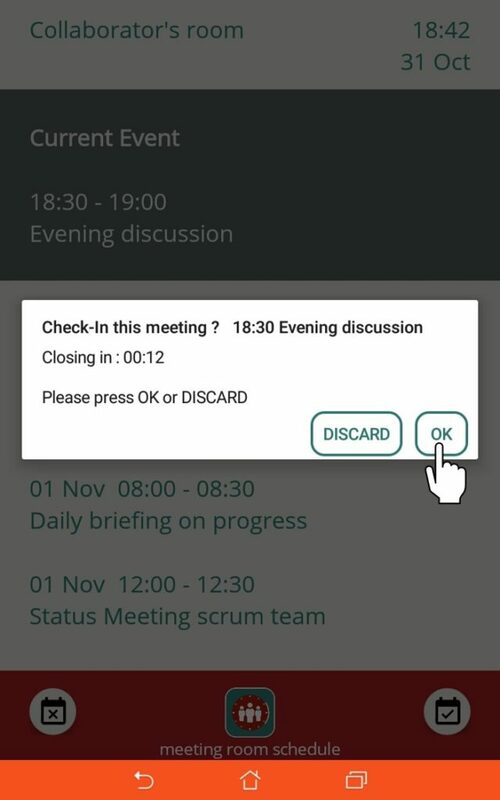 Meeting Room Schedule display can be easily connected to Microsoft Exchange solutions and can be ready for deployment in less than a minute. The app allows seamless integration with calendar in Microsoft Exchange, Outlook 365, Google etc. 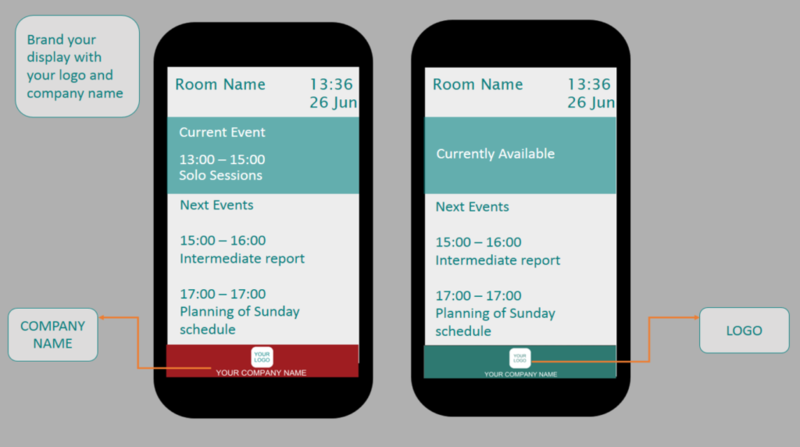 Alternatively you can also use a static .ics file to display a resource calendar with a fixed schedule. The app also allows you to access .ics file URLs over internet. In this way you can configure a URL and all the updates in the corresponding devices will be reflected in the deployed android device. 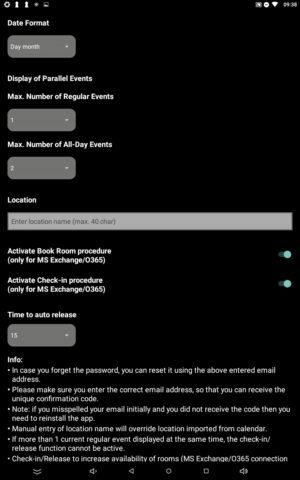 To know more about configuring and setting up the calendar on your android tablet display, check out the Quick-setup Guide . If you have any doubts or difficulty in configuring the calendar, you can write to us at support@scheduledisplay.com. Alternatively you can chat with our support staff for immediate help. Check out a video demo of integration with Google calendar. Want to customize and brand the display? We have the perfect solution for you. You can set up tons of different settings for how event info is displayed. 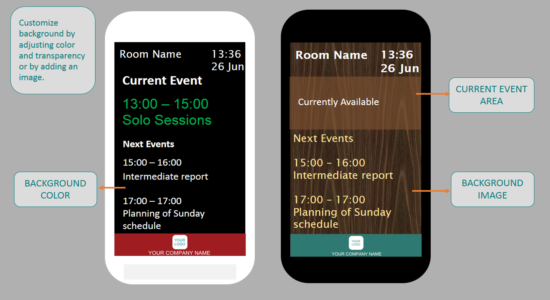 From font style and size, to background colors, photos and company logos, Meeting Room Schedule display will let you customize the event data to your preferences and style. Font styles can be adapted for your needs in the basic version. Additionally, getting a premium version allows you to configure the background image as well as branding the display with your logo. Branding Meeting Room Schedule with your own company logo, name and background picture will be possible. Resellers can get a white label product if they wish. Click here to see a video demo. 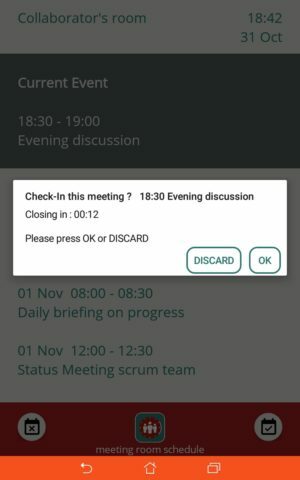 Do you often have spontaneous meeting? Did you spot a free room? Wouldn’t it be a lot convenient if you could book the room on the spot? 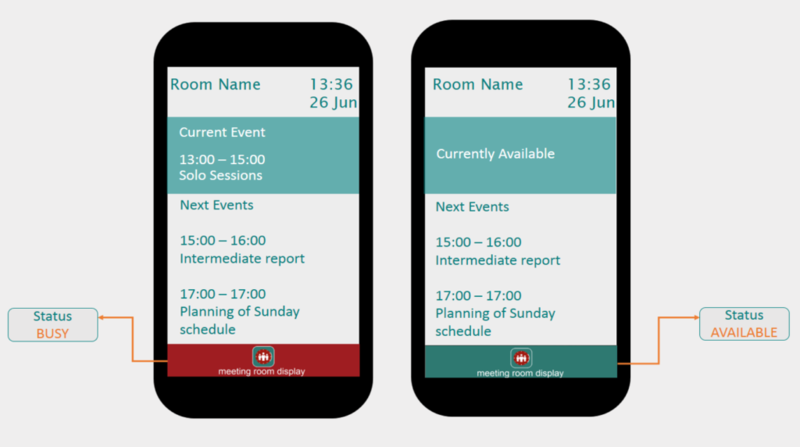 Book-room-now feature in Meeting Room Schedule display allows you to book a free room in few seconds. If a room is available and there is no meeting starting in 30 minutes, you can book a room from the display tablet. 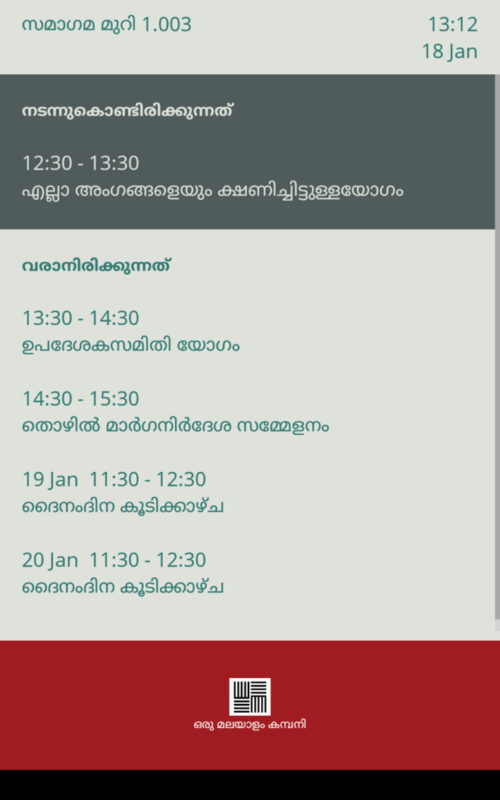 The meeting will also be updated in the exchange calendar for the resource and hence avoids any calendar conflicts. Your meeting rooms are always booked? No chance to get a time slot on the same day? More than 20% of room reservations end up being no-show meetings. 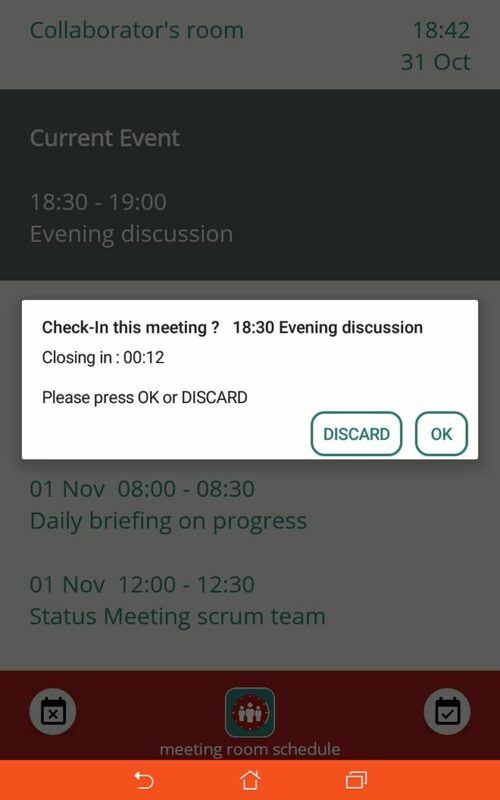 The host forgets to cancel the room reservation after deciding to cancel the meeting. This is lost room capacity which can be gained by using the check-in feature. 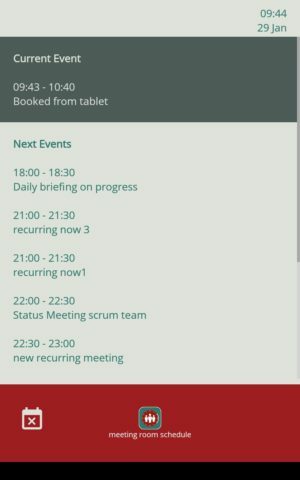 Check-in button will be displayed on the bottom right corner of the Meeting Room Schedule app main screen. The app allows check-in to a meeting as early as 14 minutes prior to the start of the meeting. The room will be released after a certain time if the host does not check in to the meeting. This auto-release time can be configured by the admin based on the resource requirement. 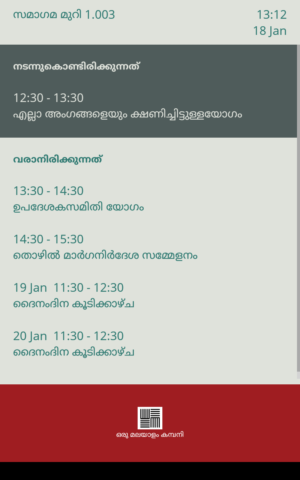 Once auto-released the meeting will be removed from the resource calendar making it available for booking immediately. 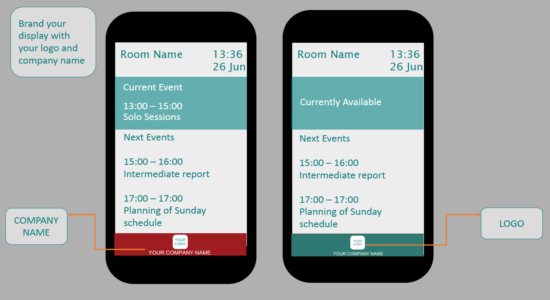 This feature will help to reduce late starters and effectively utilize the available room resources. 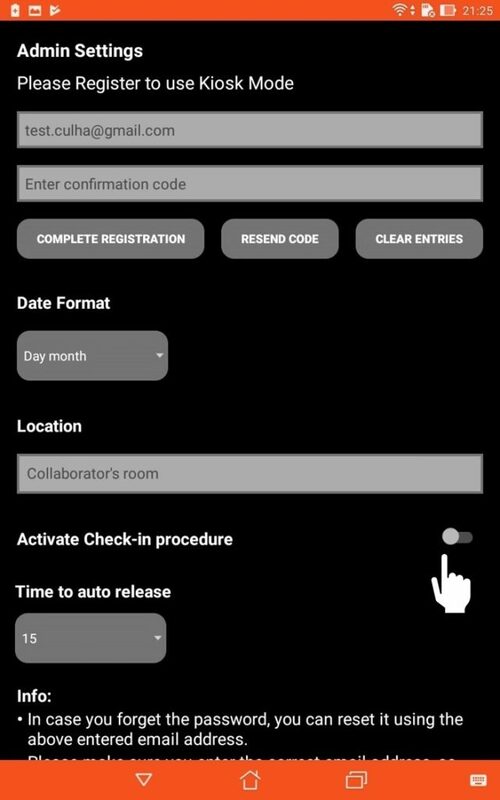 Check out in the quick-set-up guide how to set up the check-in and release features. Click to check out our YouTube videos for a quick demo of check-in and auto release. NOTE : Check-in and release options are available only for exchange server connection. Sometimes meetings end early and the room ends up being locked for the entire scheduled time duration. 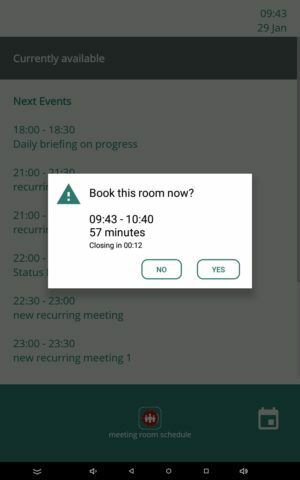 Wouldn’t it be nice if the host could release the room if a meeting ends early and thereby making it available for others to book? 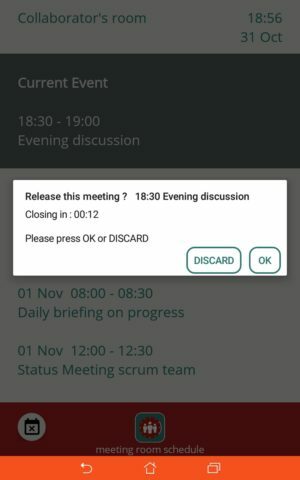 Release feature in Meeting Room Schedule app opens up new capacity in your meeting room pool. 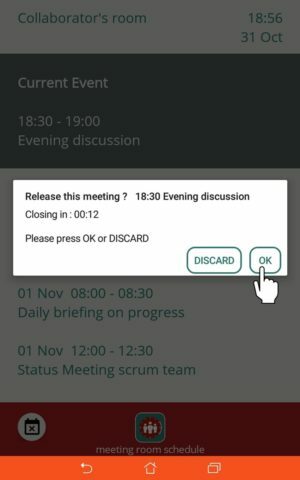 If meetings end early, participants can release the room using the release button on the door tablet. The release button is available at the bottom left corner. 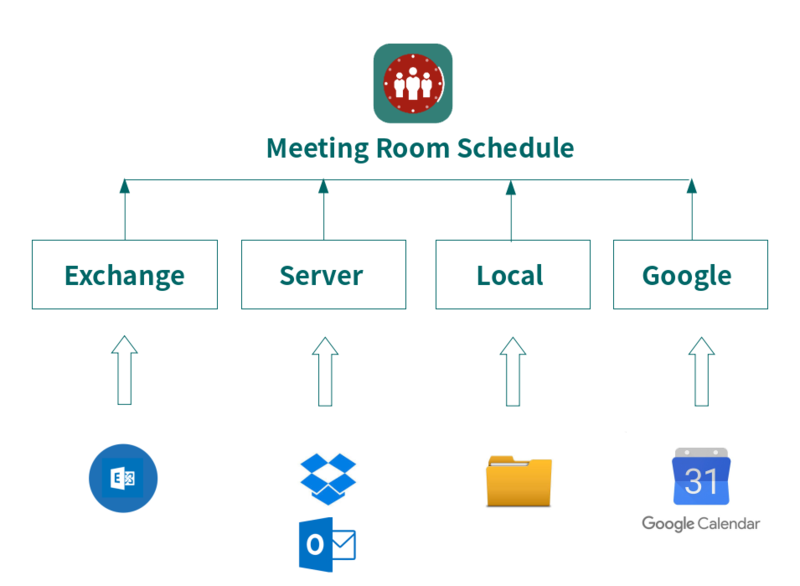 On finishing the meeting host can manually release the resource making the room immediately available for new bookings. Check out in the quick-set-up guide how to set up the check-in and release features. Click to check out our YouTube videos for a quick demo of release feature. 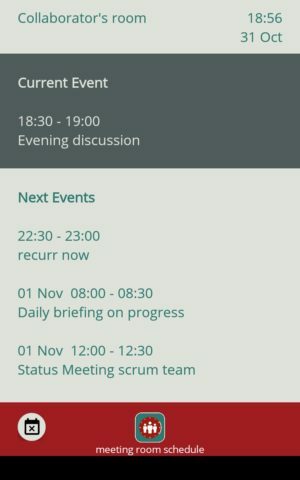 Do you want to use schedule display meeting information in a different language? 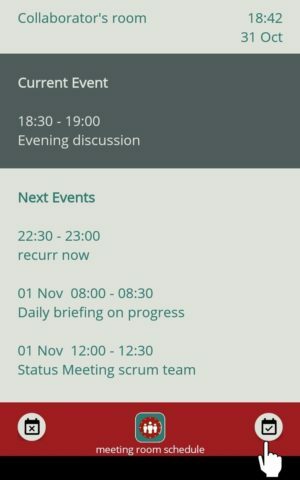 The meeting information is taken from the ics file and hence will be displayed in the corresponding language. 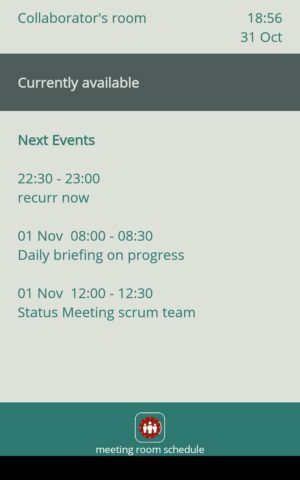 Meeting Room Schedule allows you to re-define the static headers like “Current Event”, “Next Events” and “Currently available” in any preferred language. To access this feature, you have to purchase the premium subscription. Looking for a secure app? Meeting Room Schedule display lets you prevent external interactions by any unauthorized personnel. We only ask for your email. After enabling Kiosk mode in Admin Settings, access to settings is only possible with administrator’s credentials. If your forget your password, the Reset password option sends a new password to your registered email address, which you can change any time from Admin Settings. Click here to check out a video demo of Kiosk feature.